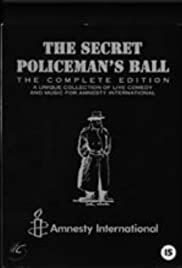 Pleasure At Her Majesty's (1976) The very first show in what came to be called the "Secret Policeman's Ball" series took place over three late nights in April 1976 at Her Majesty's Theatre in London. The show was instigated by John Cleese, who volunteered to "round up a few pals" to perform for Amnesty International's benefit. These pals transpired to be most of Monty Python, Beyond The Fringe and The Goodies (three of the U.K.'s most successful comedy ensembles) -- together with leading solo performers. It was a gathering of the British comedic tribes. Cleese titled the show "A Poke In The Eye (With A Sharp Stick)." The film documenting this comedy summit was titled Pleasure At Her Majesty's -- a wordplay on the formal British expression for imprisonment in which convicts are "detained at Her Majesty's pleasure." E.L. Wisty: They're not so rigorous, the mining exams, they only ask you one question. They say "who are you?" and I got 75% on that. This is THE best thing to happen in the history of all time! Being able to watch Alan Bennet, Peter Cook, and Jonathan Miller perform together is bloody amazing! I am unfortunately too young to remember beyond the fringe and have never seen any footage of it as it was mostly all lost back in the 60's, but this DVD gave me the chance to see the 3 of them perform together, and even though Dudley Moore isn't there Terry Jones makes a GREAT replacement and the Shakespearean sketch works fabulously. It was also great to see Barry Humphreys do his wonderful Edna Everidge performance before he became tainted by ally McBeal. The only (and I mean ONLY) down side was Bill Oddie who I hate but I do love the funky Gibbon song and Tim Brooke Taylor and the one with the chuffs are fab so it balances itself out. All in all this is a fabulous watch and well worth buying.